The 1.94 kilometer Kunyang Road bridge, the 13th cross-river bridge over the Huangpu river, will connect Kunyang Road in Minhang and the Puwei Highway in Fengxian. 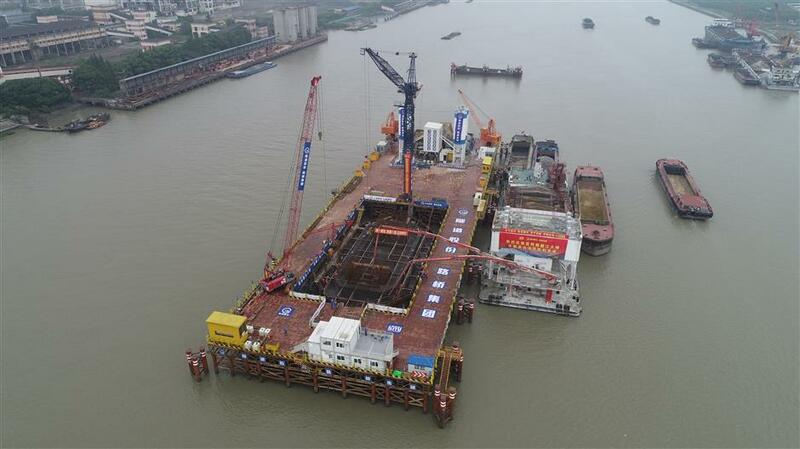 The underwater foundation and the work platform of a new bridge across the Huangpu River were completed on Monday, marking a milestone in the project to connect Minhang and Fengxian districts by 2020. 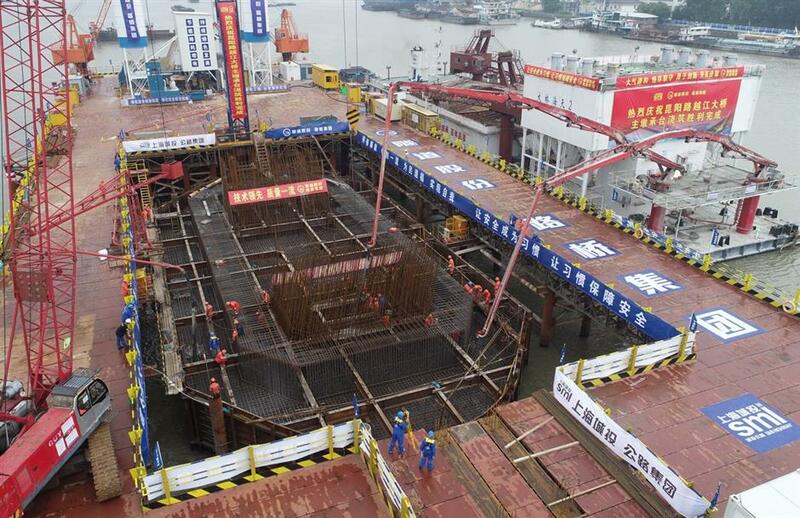 The underwater foundation of a new bridge across the Huangpu River was completed on Monday, marking a milestone in the project to connect Minhang and Fengxian districts by 2020. The 1.94 kilometer Kunyang Road bridge, the 13th bridge crossing the river, will connect Kunyang Road in Minhang and the Puwei Highway in Fengxian. It is expected to largely relieve the congestion on other cross-river bridges and thoroughfares in the southwest region of the city, said Shanghai Tunnel Engineering Co Road and Bridge Group, the city’s major bridge constructor. 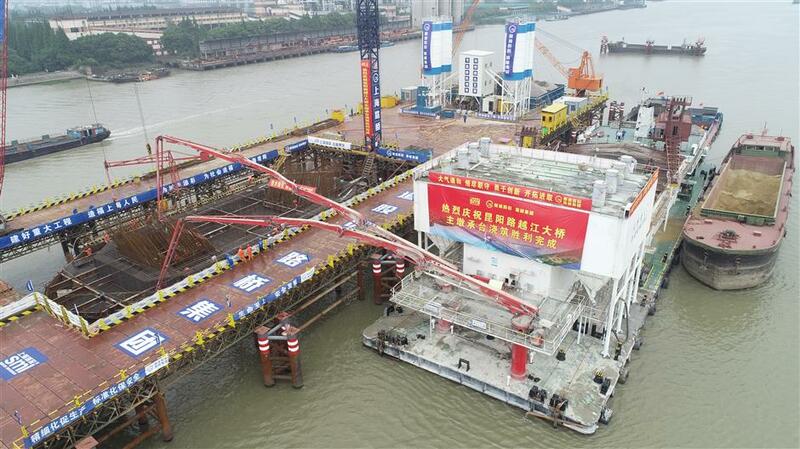 A platform above the water measuring 800 square meters was completed in the middle of the Huangpu River on Monday. The construction has now been shifted above the water to reduce influence on the busy Huangpu River waterway, Wu said. The underwater foundation and the platform are among the most difficult parts of the project, due to the large number of cargo ships as well as the deep and fast flowing water of the river, Liu Jia, deputy chief engineer of the project said. Seventy 70-meter-long steel piles have been hammered into the riverbed in the middle of the 500-meter-wide river. Over 100 workers then installed a 550-ton waterproof steel box on the piles. The workers have to take ferry boats to the construction site in the middle of the river, Liu said. 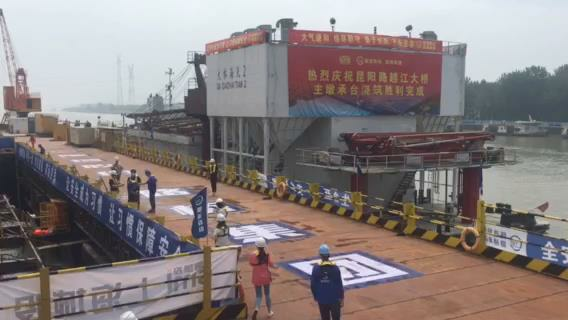 From Sunday, the workers have poured over 4,000 cubic meters of concrete into the box to finish the foundation and the platform with minimum influence on ships along the river, Liu added. About 2,000 ships pass through every day. The main tower of the bridge will be 136 meters high to allow clearance over the busy waterway, and it's scheduled to be completed in 2019. Prefabrication will be used for the first time on a bridge across the river, not only minimizing disruption to shipping but also reducing noise and pollution, Wu said. Upon its completion, residents in the two districts will be able to reach Hongqiao and Pudong airports directly. It will become one of the first double-layer bridges — the upper level for vehicles and the lower level for pedestrians and cyclists — across the river, project manager Wu Jun said. The single-tower cable-stay bridge will be served by eight elevators on both sides of the river with a capacity of 5 tons each for pedestrians and bikes, Wu said. The Fengxian District government is investing 40 billion yuan (US$5.9 billion) to build 19 traffic projects including the bridge, a Metro line and a bus-only road, as well as highways and tunnels to improve links to downtown areas.